I am honored to have received a couple of awards from the sweet Madison at Funky Cards and later from sweet Melissa from Moe Creations and had not Pay-It-Forward trying to figure it out. 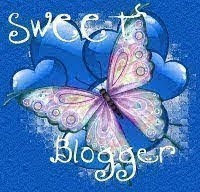 I will start with the Sweet Blogger Award and Sunshine Award. Thanks to both of you ladies, you are super sweet and bring sunshine to my days by leaving sweet, bright comments! Thanks ladies for always leaving sweet comments and being sometime the sunshine of my day!